Arizona State University and the University of New Mexico teamed up to build SHADE for their entry into the Solar Decathlon. 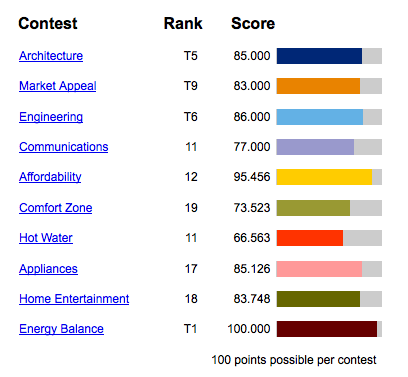 The home received 1st in the Energy Balance category by making more solar energy than the house used or needed, and 5th place in the Architecture category. The overall cost of the house with all the appliances and energy systems included was $295,445. Solar panels were used to shade the deck. 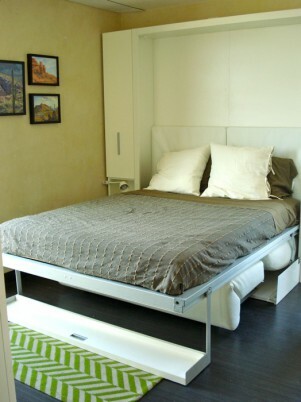 It creates quite a nice space AND generates electricity. All of this year’s homes achieve net-zero (created more energy than they used). Coming from the desert environments of their host cities, Phoenix and Albuquerque, they designed their home appropriately. 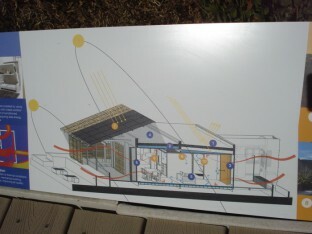 SHADE stands for Solar Homes Adapting for Desert Equilibrium. It pays homage to the desert plants that shade their core with their inherent design. 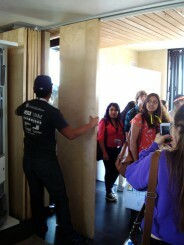 The Solar Decathlon truly tests a home’s performance by putting them through 10 different competitions. For example, in order to receive a score in the Entertainment event, each team must host two dinner parties and screen an accompanying film. 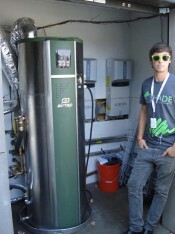 This tests the home’s general electrical systems and the combined efficiency of the appliances. They aren’t sitting around saving electricity and using candles. They’re watching films on large screen TVs, whipping up Mexico crepes, frying up sopapillas, making multi-course meals and leaving the lights on. It’s all powered by the sun. Here are the Dinner Menus and Recipes from Team ASUNM (27 page pdf, 7.1 mb with step-by-step pictures and includes a mouthwatering prickly pear and lemon granita recipe). 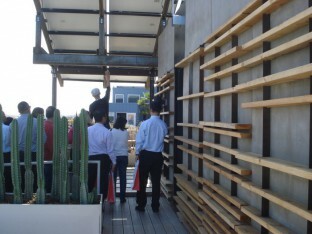 Screens on the walls provide cooling shade and a still boundary layer of air, mimicking the needles on the saguaro cactus, which perform similar functions. Fiber-cement board highlights the material warmth of the wooden shade structure as it reflects the Southwestern sunsets. Tanks store collected rainwater, which is used to irrigate the landscape. 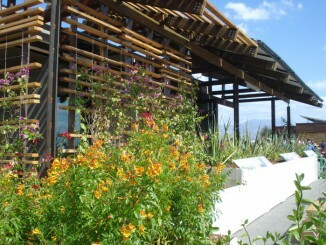 Rain screens grow native species of flowering vine and bougainvillea and provide a climate barrier. Modular furniture enables the flexible room space to be configured as a kitchen, dining room, living room, bedroom, or office. 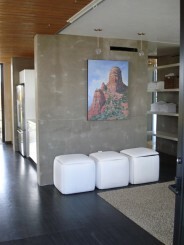 Natural clay coating the interior walls provides a humidity buffer. The independent solar canopy is composed of 36 high-efficiency mono-crystalline photovoltaic panels. Phase-change material distributed throughout the house stores thermal energy and buffers temperature fluctuations by redistributing the energy as passive heating and cooling. The capillary radiant system in the ceiling, working with the phase-change materials in the floors, passively charges at night while the ceiling mechanics shift the peak load. A thermal battery in the mechanical room concentrates low temperatures at night and then slowly thaws ice to cool the space during the day in an adaptation of commercial-scale ice storage systems. A whole-house system controls the energy systems and monitors the efficiency of the solar panels. The team finished in place 17th place with a total of 823.165 points. 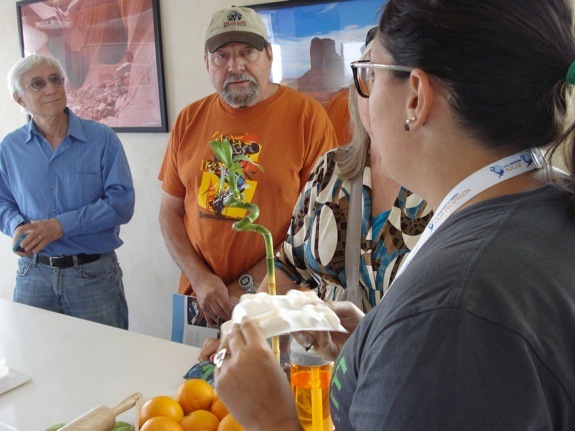 All of the teams achieved a lot in the Solar Decathlon to design, build, finish, dismantle, transport, rebuild, compete in the competition and display the homes (with a smile, over and over and over again) to help educate the public. They all had amazing, sometimes arduous, yet highly educational and rewarding experiences. The final score is a summation of task completion, monitored performance of the homes and jury evaluations within 10 events. Phase change materials were used throughout the house. 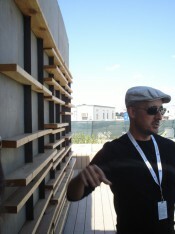 Features and technologies sections from solardecathlon.gov.